This is a beautiful dress. The print is delicate and pretty, something that’s new for me because the prints I favour are often bold or bright, making this dress a lovely departure for me. I love the piping detail along the waistline and shoulders, and the little buttons on the cinched waist. Also, the name itself is just downright adorable. All The Umbrellas In Paris? Too cute! I couldn’t resist incorporating some of that umbrella whimsy into this blog shoot while I showed you this dress in action. This is a lovely dress because the cut and print make it a really versatile-wear dress, allowing you to wear it casually or dress it up. I could just as easily throw this on with flats for a fun day out or to run my errands in style as I could to go out to dinner, or to style it up for attending a spring wedding. The dress runs true to size and has a very modest neckline, which is great for you pinups who don’t like to have your decolletage on show. There’s plenty of room in this dress for bustier ladies too, which is always a bonus as I know how hard it must be to find dresses that will accommodate your assets. This dress also comes in a plain khaki green colourway, named Polly//All The Umbrellas in London–because, you know, we Brits are a plainer lot than the Parisians 😉 ha. The dress is $92 but pssst–if you sign up to the Bitter Root Vintage newsletter you get 20% off your next purchase. Bargain! Bitter Root Vintage has a wonderful staff who are always happy to help, my experiences communicating with them being downright charming. They wrap their orders beautifully and often send hand written thank you notes along with them, which is such a lovely touch in this age of cold and distant online communication. Those kind of touches lend such a personal feel to the experience and I really enjoyed that aspect of receiving my order. I’ll definitely be returning to BRV in future and getting plenty of wear out of this little Polly. Bonus feature: Spot the funny feature in the picture below! 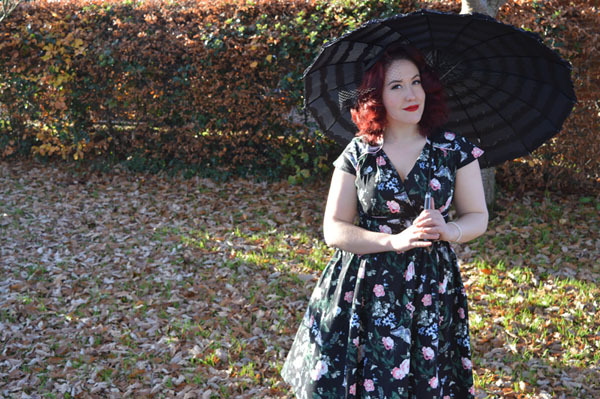 This entry was posted in Clothing Reviews, Pinup on a Budget and tagged 50s, bitter root vintage, fashion blogger, fblogger, lindy bop, pinup blogger, pinup girl, retro, retro blogger, retro style, vintage style by missamymay. Bookmark the permalink.